Total weight: I still haven't weighed myself. Stretch marks: It's the same as last week really, I have a few but, to be honest, they haven't got any worse, or bigger or darker which is a good sign. 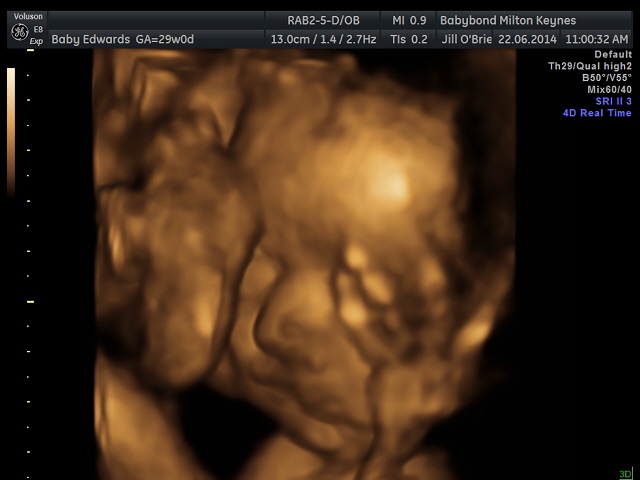 Best moments this week: We had our 4D scan this week, I'm not going to reveal too much because I have a blog post coming up later in the week, With lots of pictures and information about the scan. Miss anything: I miss the joy of eating. For my entire pregnancy, eating has been tainted by morning sickness, followed by indigestion. The biggest thing I look forward to after giving birth is eating as much as I like without worrying about regretting it later! Movement: I have been told that in the third-trimester little lady will slow down with the movement, she'll sleep more, and I won't feel her kick so much. I'm wondering if she missed the memo on this because honestly, she doesn't stop wriggling. A new thing is, I'll be sitting there, all will be calm, then all of a sudden I will get this really sick feeling like my tummy is churning. I know that's just her practising her somersaults. Symptoms: This week has been a pretty easy one, dare I say it! Apart from being really tired, everything else has been absolutely fine! How do I feel: I'm feeling a little better about myself this week if I'm honest. I'm not sure if this is because we're away from home, and I literally don't have time to feel anxious, a change of scenery usually does help me. It's also been really nice to spend time with Sam just us for a change since he's been working a lot. Week 28: Her muscles and lungs are continuing to mature, and her head is growing bigger to make room for her developing brain. To meet her increasing nutritional demands, you'll need plenty of protein, vitamins C, folic acid, and iron. And because her bones are soaking up lots of calcium, be sure to drink milk.